"This hearty soup is a great 'warm you upper' for a cold winter night! Served with fresh grated Romano cheese and oven warm Italian bread, it's a hit any night of the week. Mangia!" Bring a large pot of lightly salted water to a boil. Add orzo pasta and cook for 10 minutes or until al dente; drain. In a large saucepan over medium heat, heat the olive oil and saute the onion and garlic until tender. 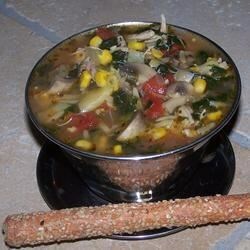 Pour in the chicken broth and sherry, and mix in corn with liquid, artichokes, cooked chicken, and mushrooms. Season with salt, pepper, and red pepper. Cook and stir until heated through, about 10 minutes. Mix the spinach, tomatoes, and cooked orzo into the saucepan. Continue to cook and stir about 10 minutes, until blended and heated through. I felt this soup was okay but needed something. I just don't know what and everyone who reviewed seemed to love it as is. It was great! I left out the mushrooms, used cous cous instead of orzo and fresh spinach instead of frozen. It was easy, tasty, and colorful but a bit salty. The soup is even better the second day or third day. I used the fresh spinach and left out about 2 cups of water from the chicken broth. Also added a can of black beans it added a lot of flavor. Delicious! I used stewed tomatoes instead of dices, added a can of Italian green beans and some herbs. I will be making this often!